CBS Sportsline is a controversial website among certain fantasy football elitists. If you go on a fantasy sports site like "The Huddle", you’ll see lots of fantasy players criticizing CBSSportsline as overpriced and lacking services. Of course, the Huddle is closely connected to MyFantasyLeague, so that’s to be expected. 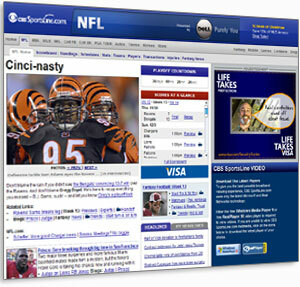 NFL on CBS pregame show, Sportsline is one of the largest fantasy football websites on the internet. Here’s what you might hear from one of CBS Sportsline’s celebrity endorsers. When you�re in the mood to play some fantasy football, you might want to consider the fantasy football services offered by CBS Sportsline. With both free and pay games available, they having something for everyone�s budget. Gold League – Costs $39.95 per team, and the league champion wins a $200 prize. Platinum League – Costs $99.95 per team, and the league champion wins a $600 prize. Diamond League – Costs $249.95 per team, and the league champion wins a $1,600 prize. Double Diamond League – Costs $499.95 per team, and the league champion wins a $3,500 prize. Free League – Costs nothing to play, but no league prize is offered. However, all first-place finishers in free leagues will be entered into a random drawing, and one lucky owner will be declared the League Champion Prize Winner. That owner will receive $10,000. Free leagues will include 12 teams, with each league being divided up into three division. Each team will have 14 players, and the regular season will last for 14 weeks. Once the playoffs begin, the four best teams will advance. In the Fantasy Football 2008 pay leagues, you set up a single team and compete against the other members of your league. You have no control on scoring or rules, and CBS Sportsline runs everything. All you do each week is set a line-up and cross your fingers. If you want more control, your league should purchase the premium Football Commissioner league for only $149.95. You can invite up to 12 of your friends to play, and you can customize every feature to your liking. No league prize is given to the champion, but you and your buddies are always free to make a friendly wager on the side. For the price of the Fantasy Football Commissioner package, you get a private league website where players can make trades, check stats, set lineups and perform any other actions needed. Scoring and transactions can be customized, and fantasy drafts can be held online or offline. On game day, you can keep up with your players� performances with the live scoring feature. Each fantasy star�s stats are updated in real-time, and these numbers are reviewable throughout the NFL season. You can even access this feature with your favorite wireless device. When joining a league, you need to decide if you want to join a public or private league. Anybody can join a public league, while private leagues are limited to those who have the necessary password (usually friends and co-workers). To join either, all you have to do is enter some basic information (home address, email, etc.) into the CBS Sportsline database. It�s that easy! And if you�ve ever won a CBS Sportsline league, you�ll also be eligible to compete in the exclusive Winner�s Leagues. There�s no better way to prove your fantasy football genius than by beating other former champions. CBS Sportsline Fantasy Baseball – Auction drafts have been added, and you can sign up as commissioner and try their service for free for 14 days. CBS Sportsline College Fantasy Football – Players from every major college program are available, and owners can compete in head-to-head action every week. CBS Sportsline Fantasy Golf Challenge – Working with a salary cap, owners select the five best golfers available and compete head-to-head for a grand prize of $2,000. CBS Sportsline Fantasy Racing Challenge – Draft a squad of NASCAR greats and compete head-to-head throughout the racing season. Over $5,000 in cash prizes are being offered. CBS Sportsline Fantasy Basketball – Play in a fantasy basketball league for free or become commissioner of your own league. You can even play for cash in the CBS Sportsline premium leagues. CBS Sportsline Fantasy Hockey – Draft your favorite forwards and goons and compete head-to-head with players from around the world. Cash prizes are available, or you can enjoy the competition for free. CBS Sportsline College Basketball Brackets – Pick the winners and losers of the annual NCAA basketball tournament, and then match your brackets against friends, co-workers and even total strangers for cash and prizes.